I am very interested in this question because I think the way we view the face and the smile is changing with massive growth of the “selfie”. We are used to the artificial nature of a pose, the expectation to smile for a picture, the mask that we put on and present to the world – not necessarily a false mask, but to communicate “I am having a great time” we smile. It is a message in a picture. When we meet people we smile to welcome them. A smile is a social construct. It conveys the message that we are not a threat. 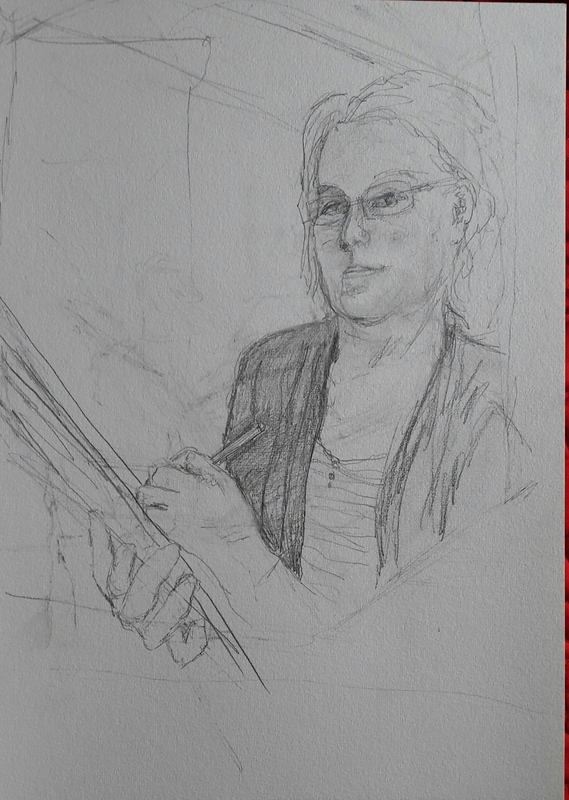 In drawing my self portrait for Assignment 4. I decided to make myself look less cross by smiling slightly. I felt this conveyed my inner self more than an intense gaze. 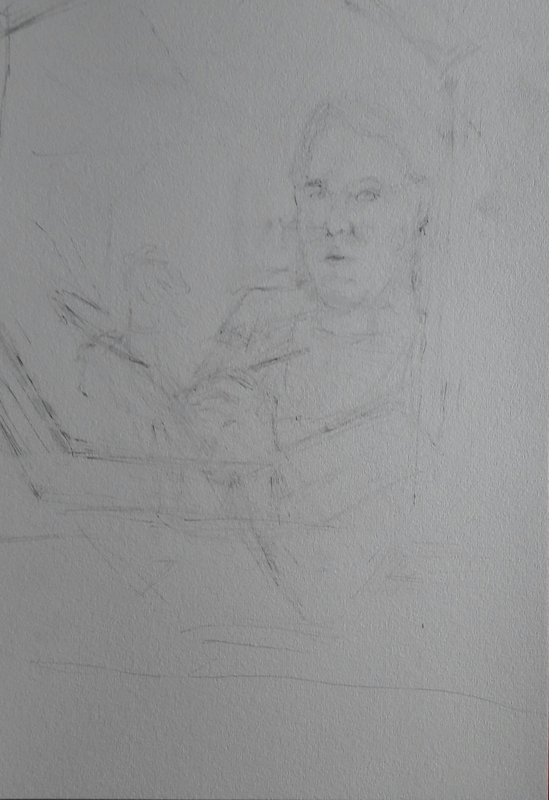 I was aware at the time that this was slightly unconventional for a self-portrait although I did look at Rembrandt who has a higher smile rate in his portraits than most. Fig. 1. Rembrandt self portrait. Etching. I love this etching (Fig.1) which is full of vigorous lines but also delicately drawn to bring out the facial features showing a little smile. It is mysterious but good humoured, full of energy but still. Fig. 2. Rembrant Laughing. Rembrandt Harmensz. van Rijn. Oil paint on copper. 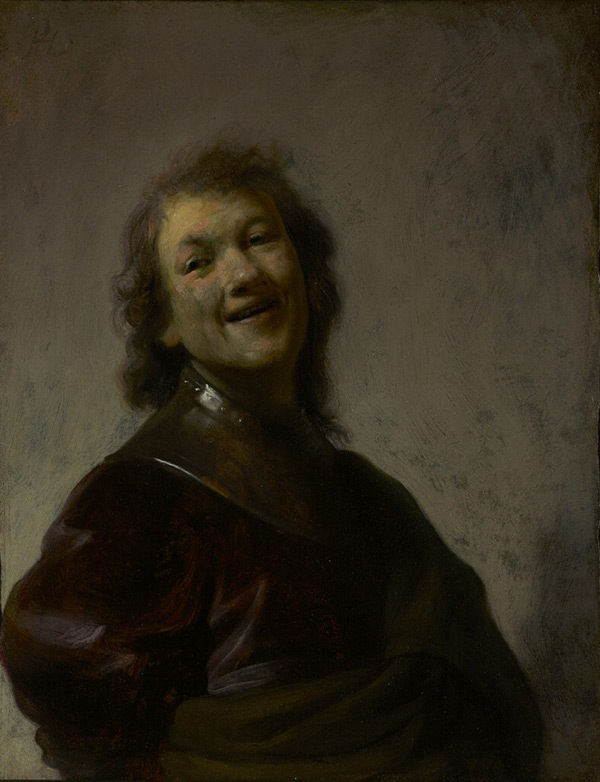 In Rembrandt Laughing (Fig 2) the young artist portrays himself as laughing out loud in costume. This gives a hint of why portraits of fleeting emotions, like a belly laugh, are so rare. They make it harder for a viewer to suspend disbelief. Unlike a photograph, a painting is made over a period of time. 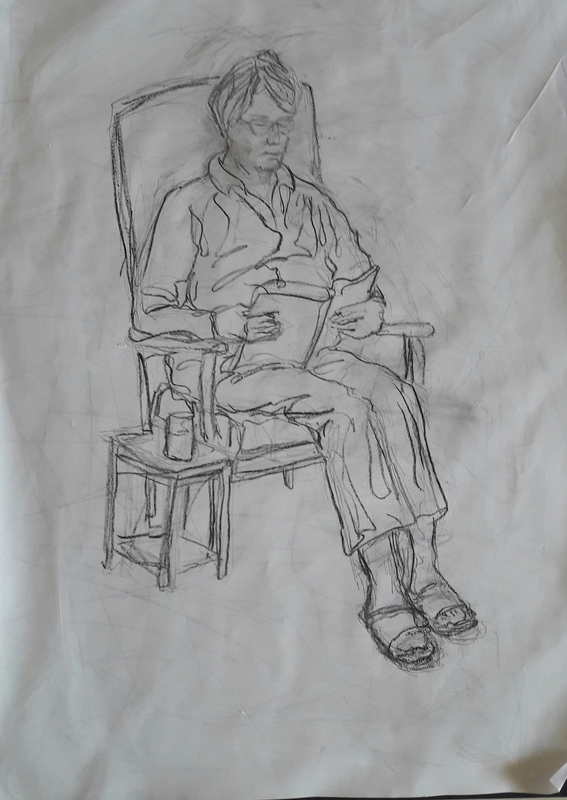 A person sitting for a portrait would naturally sit still and maintain a steady expression, a person viewing the portrait can fool themselves that they are looking at a person sitting still and looking back at them. Looking at a person laughing out loud, you know immediately that they are a painting because they are not moving. This makes a laughing portrait more artificial. This is actually one of only a few self portraits by Rembrandt showing himself smiling or laughing although he did do a number of portraits of other people including his wife Saskia smiling. Cindy Sherman’s work is very much about artifice. Since the late 1970s she has produced self portraits using props and makeup to reflect various “styles” of depicting women from film noir and horror to Renaissance style portraits (which also included some pictures of men). These pictures reveal the narratives about women which are embedded in our culture. 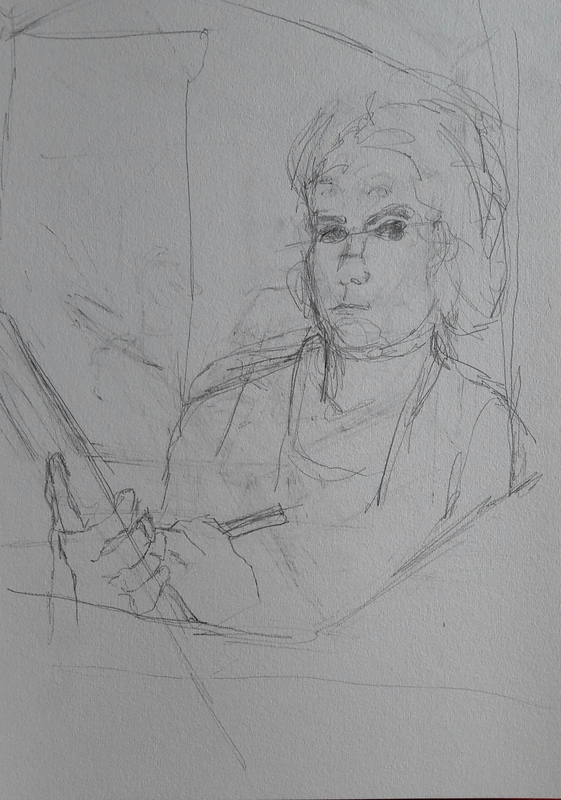 But Sherman herself says they are not “self” portraits at all. 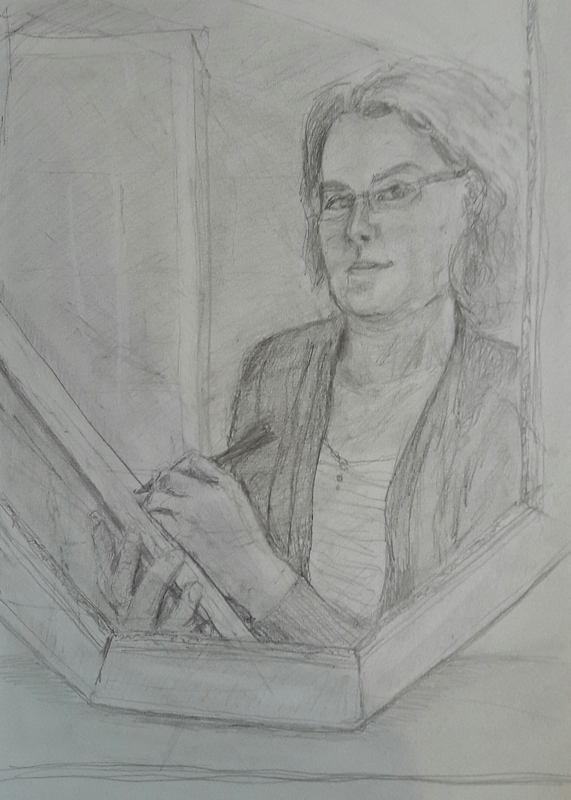 ‘People assume that a self-portrait is narcissistic and you’re trying to reveal something about yourself; fantasies or autobiographical information. In fact none of my work is about me or my private life.’ My vile bodies: Cindy Sherman interview by Judy Rumbold – Guardian archive, 1991. Although in the same article she admits that the work may come out of her own neuroses. ‘Maybe I am well-adjusted because I live out my neuroses on film instead.’ Which means maybe they are self portraits after all. Sherman’s subjects are often grotesque and their smiles are too. In a series from 2008 she depicts groomed older American women whose masks sometime slip, showing the vulnerability underneath the clothes and warpaint. It is interesting how the backgrounds to the characters are an important part of the image conveying wealth or poverty, power or vulnerability. Fig. 3. Saskia van Uylenburgh als Mädchen. 1633. Rembrandt Harmensz. van Rijn Oil on Oak. from Gemaeldegalerie, Dresden. Eva Respini MOMA Assistant Curator discussing Cindy Sherman’s work in relation to a retrospective of her work at MOMA in 2012. 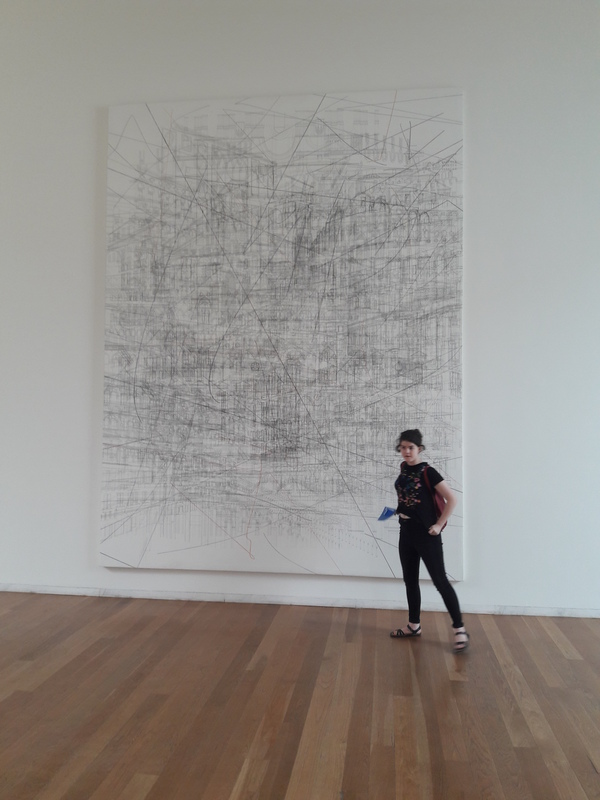 On holiday in Porto, I was delighted to find the contemporary art gallery Serralves had a major exhibition of work by Julie Mehretu whose work I enjoyed seeing as part of a study visit at Tate Modern last year. I find her massive canvases intriguing with a combination of architectural-style drawing, vigorous mark-making and controlled use of colour. These are layered with thinly applied acrylic paint creating a depth of impressions. 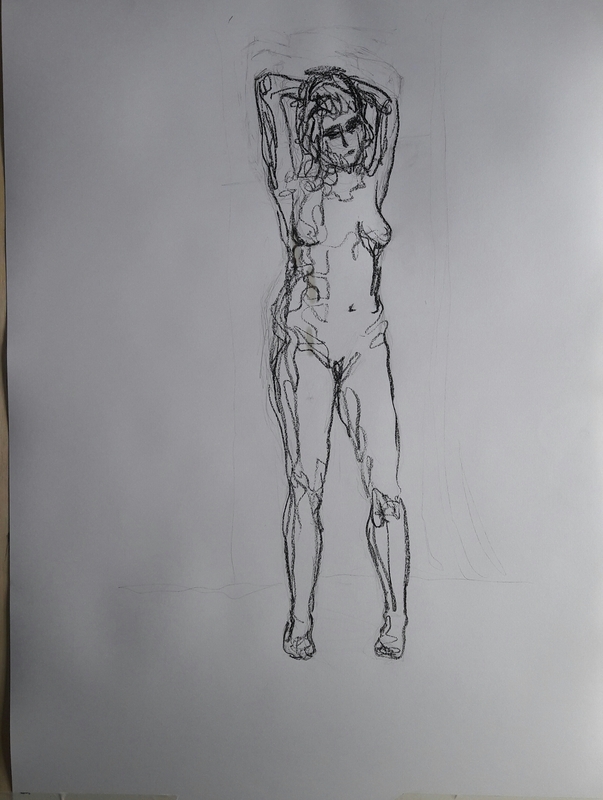 It is not obvious what all the marks mean to the artist. 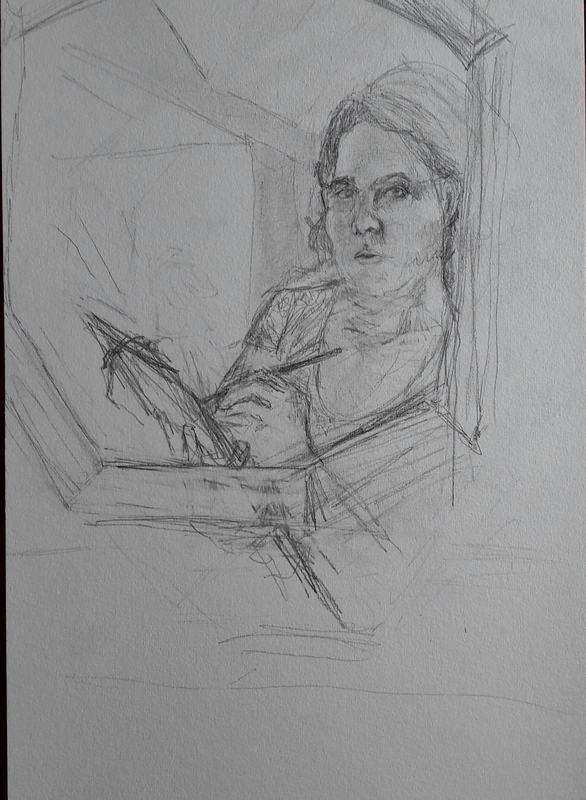 In Venice (fig. 1a & b) The architecture of Venice lends itself to the repetition of ornate structures especially windows which gives an impression of the overwhelming nature of being in the city. Fig. 1b. Venice (detail). Ink and acrylic. In Plovers Wing (fig. 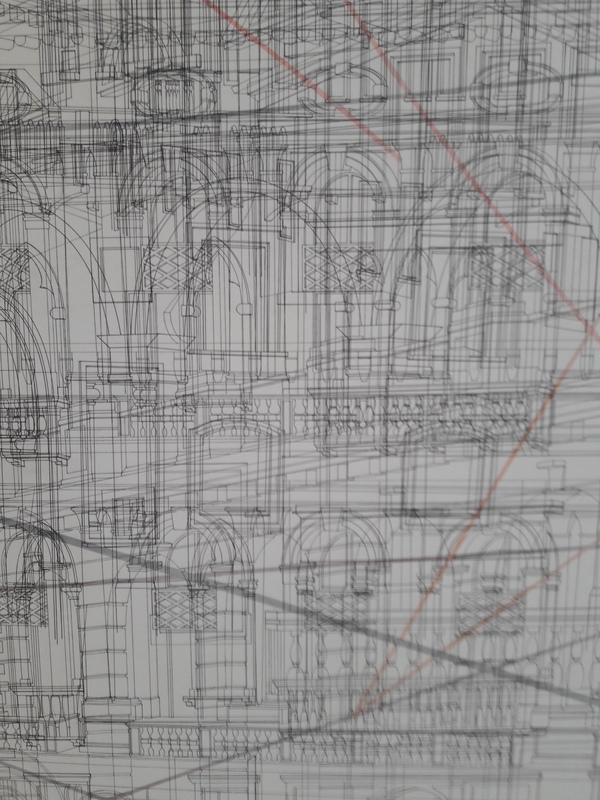 2a & b) The architectural drawing is there but more abstract and is combined with beautiful, mysterious, coloured shapes. Do the shapes describe the movement of the wing in the title? Fig. 2a. Plovers Wing. Ink and acrylic. Fig. 2b. Plovers Wing. (Detail). Ink and acrylic. 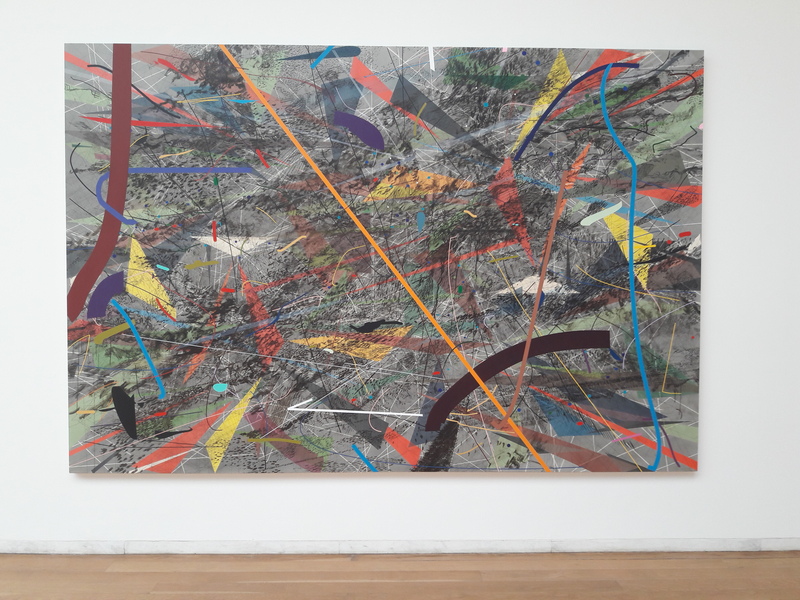 While researching online to find out more about the artist I was interested to read an article in The Guardian by Brian Dillon from 2009 which describes Mehretu’s use of studio assistants who transfer the drawings – which are abstracted from photographs – onto canvases. Looking at the canvases you marvel at the detail combined with the overall impact. 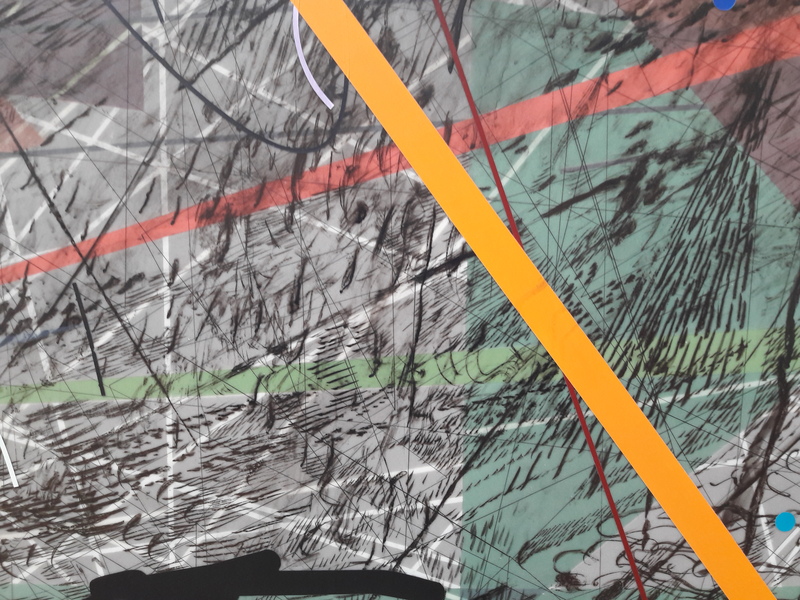 A canvas where mark-making comes to the fore is Mumbo Jumbo (Fig. 3a & b). Shoals of ink marks make their way across the colourful canvas. 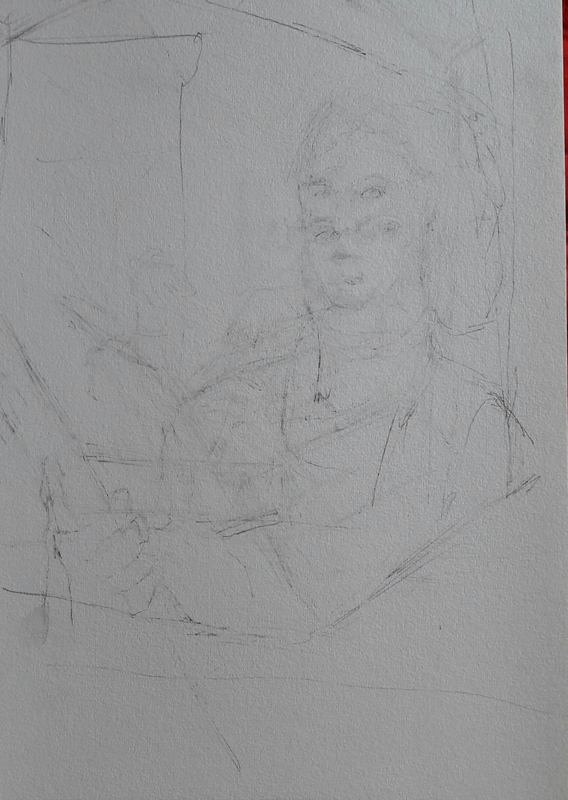 The architectural drawing is hinted at but is not as prominent as in other canvases. Fig. 3a. Mumbo Jumbo. Ink and acrylic. Fig. 3b. 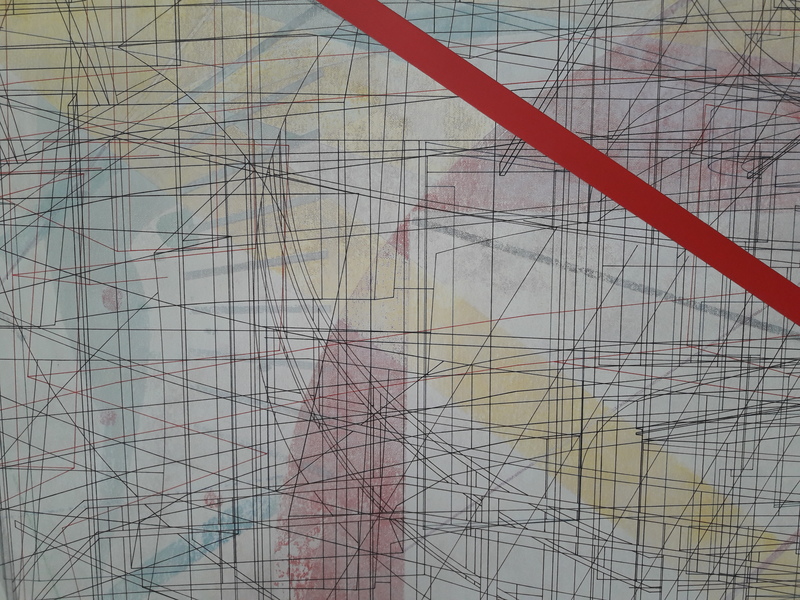 Mumbo Jumbo (detail). Ink and acrylic. 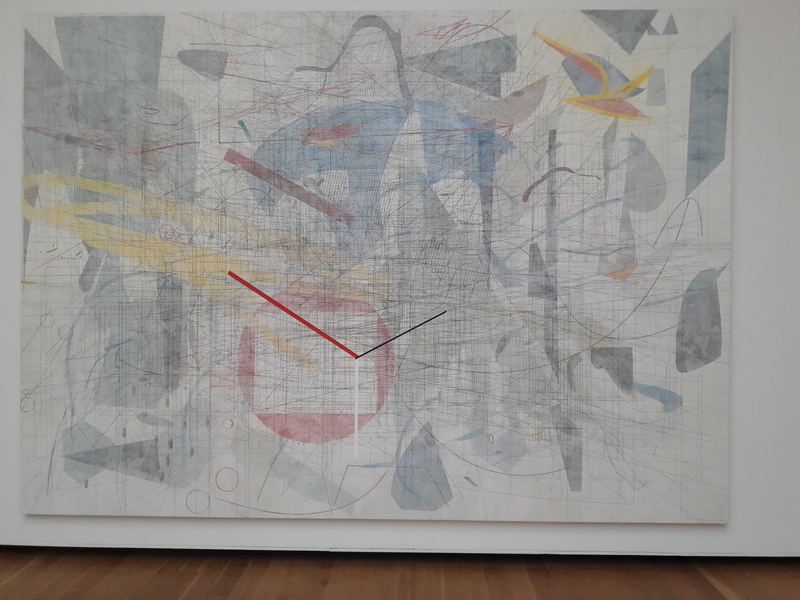 Mehretu’s drawing/paintings work from a distance and in detail. They seem coherent and accomplished on every level. 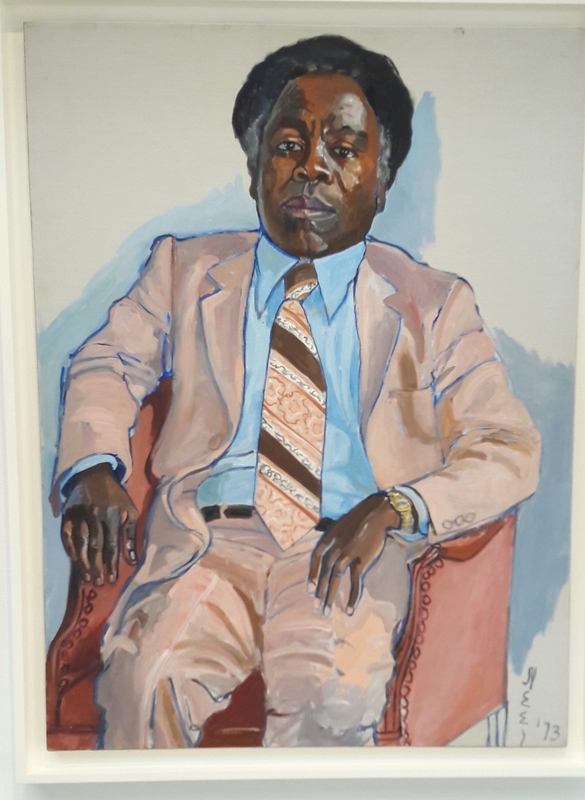 Alice Neel exhibition. Victoria Miro Gallery. 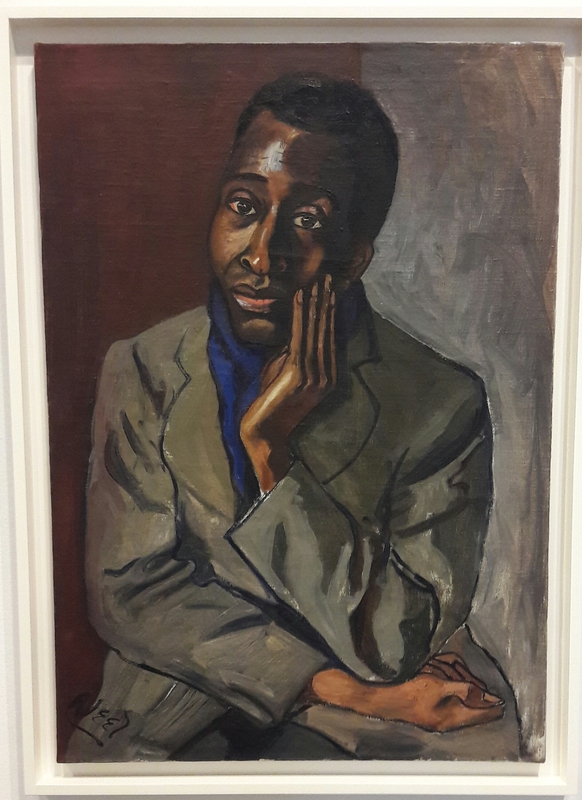 I have been interested in Alice Neel’s work since seeing a documentary on the artist on BBC iplayer. I was keen to see this exhibition featuring her work. 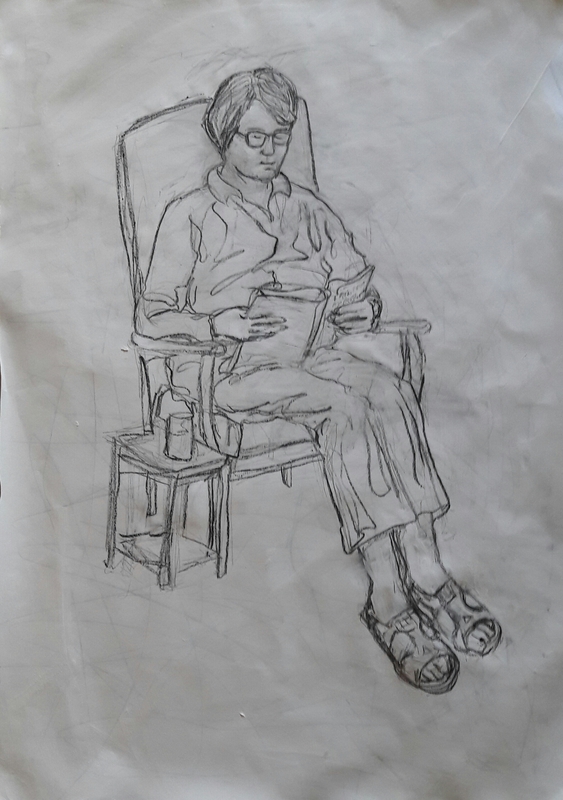 Neel successfully brings out aspects of the sitter’s personality. How does she do this? 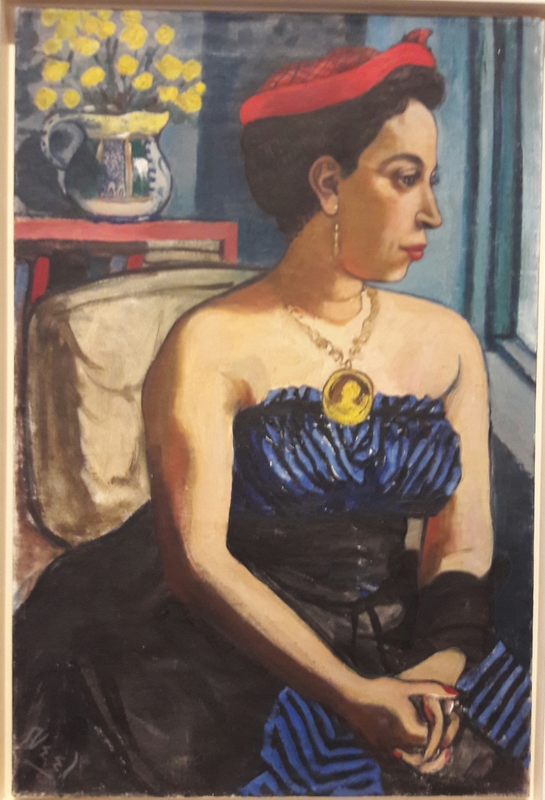 In many ways her paintings look quite naive with black lines delineating the subject’s outline, blocky tones, colourful clothes, distorted proportions and often sketchy backgrounds. But the personality shines through. Author ewilsonartPosted on August 25, 2017 August 29, 2017 Categories Gallery visits, Part Four. 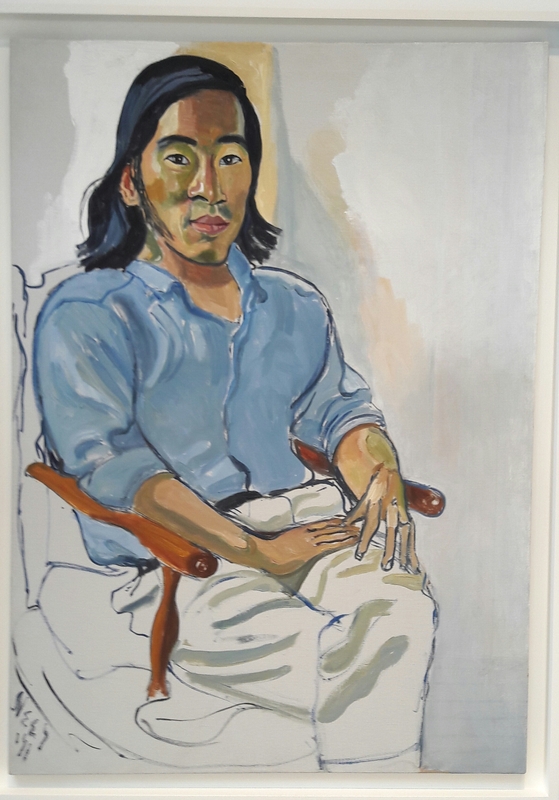 The Figure and the HeadLeave a comment on Alice Neel exhibition. Victoria Miro Gallery.